Pack a lunch, grab some refreshments, and hit the road. 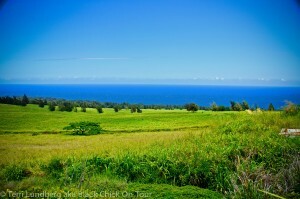 The Big Island is really the only island among the Hawaiian Islands in which you can really put the pedal to the metal. This road trip is an excellent way to spend the day. Starting out in Kailua-Kona or Waikoloa head north on Highway 19 (Queen Ka’ahumanu Hwy) go through Waimea, along the Hamakua Coast. 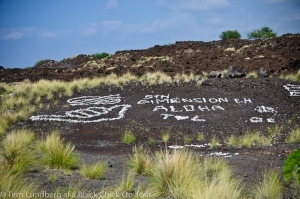 Make sure to take the Scenic Route on your way towards Hilo, the turnoff is located between mile markers 10 and 11. Once you’ve reached Hilo, get out stretch your legs and cruise around the small downtown. If you’re lucky enough to be there when they’re having their Farmer’s Market, you absolutely must stop and pick up some of the best tasting fruit ever!! PIck up Hwy 11 (Hawaii Belt Road). 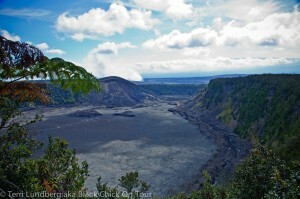 This will take you directly to Hawaii’s Volcanos National Park. The park alone can be a separate daytrip in itself. However, depending on the time of year, you can easily spend 2 – 3 hours at the park, and still make it back to your hotel before dark. Continue on Hwy 11 past the barren lava fields, towards South Kona. 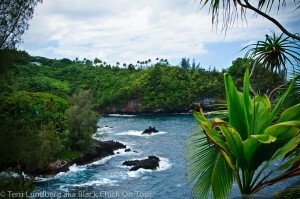 If you’ve got time and it’s still day break you may want to stop at Punalu’u State Beach Park (aka Black Sand Beach). 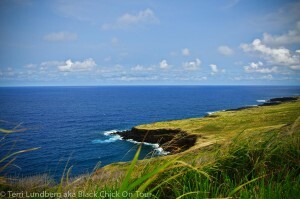 There are so many scenic stops along the way, and it’s an effortless way to see the island. Stop for a picnic at Kolekole State Park. 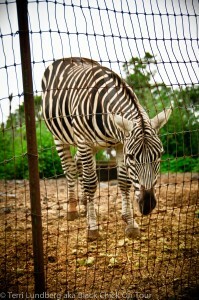 And, if you’re lucky, you may see a zebra that is a pet in someone’s backyard garden. As you walk along the beaches in Waikaloa, there are white pieces of coral all along the beach that you can use for your artwork. Do NOT dive or snorkel for them as this is viewed as tantamount to eco-terrorism. If you can, I would say start collecting them on the first day, and by your last day you should have enough to do something really fun. This is a must do. 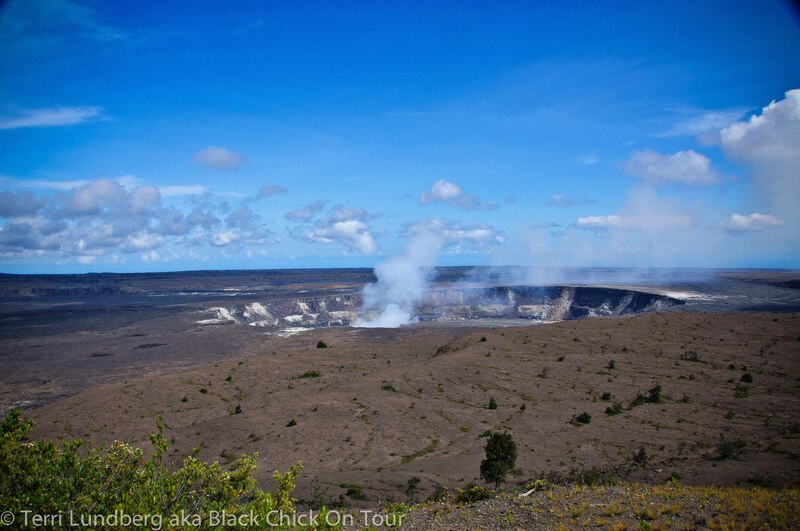 The bottom line is this, if you go to an island that has an active volcano, you have to go check it out. If you can, make this an all day trip. 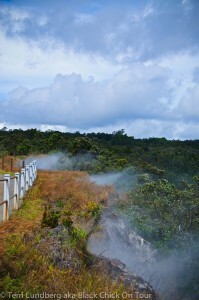 Spend the day, check out Halema’uma’u Crater; the steam vents (yes, you can see steam venting from the ground reminding you that she’s alive and well); go to Jagger Museum, hike Mauna Loa’s Observatory Trail (there are numerous other trails depending on your level of fitness, some are even wheelchair assessable), see ancient petroglyphs; and walk through Lava tubes. 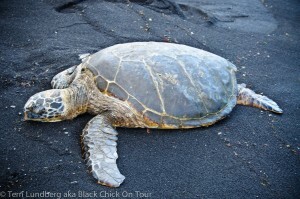 Famous for its black sand and basking green sea turtles, this is a popular beach with both the tourist and the locals. It’s not a good beach for swimming, but the park has several picnic pavilions, rest rooms, and drinking water, making it the perfect pit-stop while you’re circumnavigating the island. 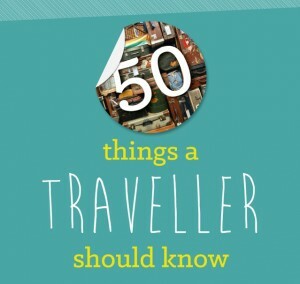 There are two exits between mile maker 56 and 57 that will get you there. And, if you’re lucky, you will see the turtles chillin’ on the beach. And, remember don’t touch them! We say “shaved ice”, Hawaiians say “shave ice.” Either way, this fine cut Hawaiian version of a snow cone is the best ever. I feels like silky snow on the tongue. 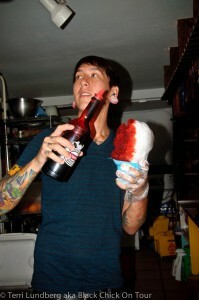 There really is no better way to cool of while walking the streets of Kailua-Kona than with a shave ice. Fly over waterfalls!! 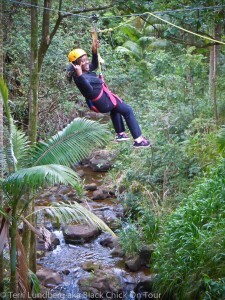 Go Zip Lining!! Yes!! 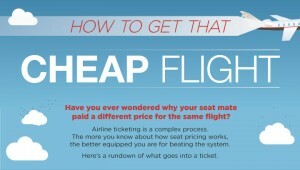 I’m saying it again…it’s a must do. 🙂 This activity isn’t for everyone, there are age and weight restrictions and certain medical issues (ie back injuries, pregnancy) that one may want to consider prior to participating. There are several operators on the island. 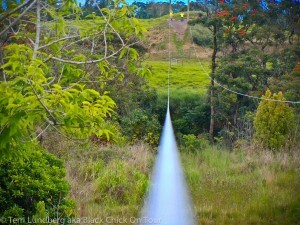 The Honolii Mountain Outpost boasts the longest zipline in Hawaii with their Umauma Falls Zipline Experience. Seeing these pictures, make me want to visit Hawaii again, there was a lot I didn’t see when I was there. Might even do the zip line.